Sorbet turned cocktail? 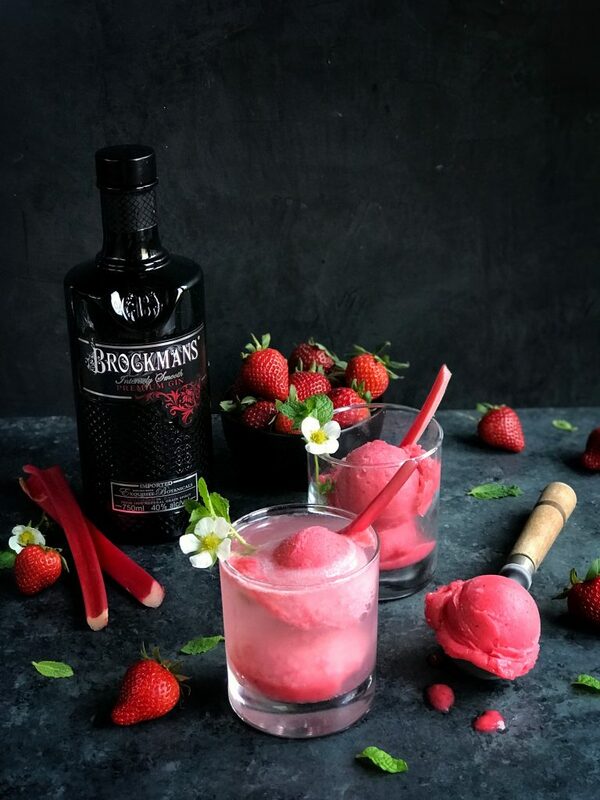 We couldn’t think of a better way to celebrate spring than with our Roasted Strawberry, Rhubarb and Brockmans Gin sorbet. 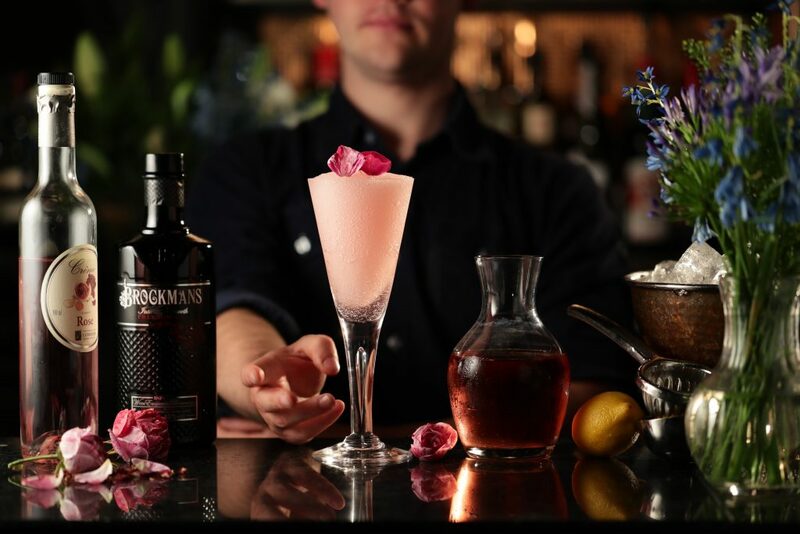 And for those who like a bit more gin… we’ll demonstrate how to make a sorbet float. Preheat oven to 350 degrees F/175 degrees C. Place strawberry, rhubarb, and two tablespoons sugar in a large bowl and mix to combine so that all the fruit is covered with sugar. Toss on a large baking sheet and spread the fruit out so that it is in a single layer. Bake for 25 minutes. Remove the tray from the oven and allow the fruit to cool to room temperature. While the fruit roasts, make the ginger infused simple syrup. In a small saucepan, over medium-low heat, combine ½ cup/64g sugar and ½ cup/115ml water. Cook for about 3 minutes or just until the sugar dissolves and the mix is clear. Remove from the heat and add the sliced ginger, allowing them to steep in the warm syrup. Once the syrup is cool, remove the slices of ginger and add the lime zest and juice and the gin. Take the roasted fruits and carefully scrape the pan to get all the pan juices. Add the roasted fruits and pan juices to a blender and blend until smooth. Place a fine sieve over a large bowl and pour the blended fruits into the sieve. Press on any solids with a back of a spoon to extract the liquids and then discard whatever remains. Add the ginger simple syrup mix to the bowl with the strained fruit juices. Refrigerate several hours or overnight until completely cold. Pour the chilled sorbet base into your ice cream machine and churn according to the manufacturer’s directions. The sorbet should be ready in about 15-20 minutes. You can eat it right away for a soft sorbet. 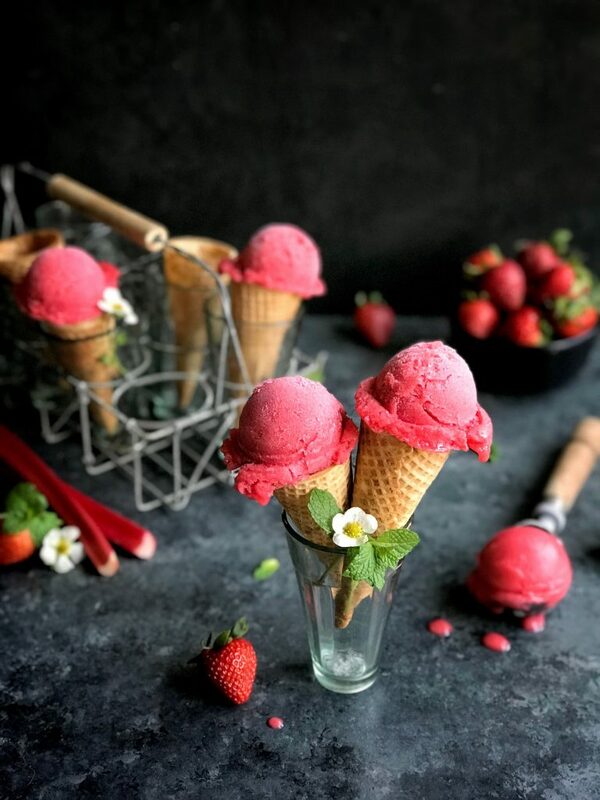 If you want to be able to scoop it, place the sorbet in a freezer safe container, cover the top with wax paper, and freeze overnight or until firm. In a tumbler or large glass, add 1-2 scoops sorbet and gin, and then slowly pour over the tonic water! It will fizz up, and the top becomes creamy as the sorbet melts. Enjoy! Note: you can add a splash of lime juice to this too, the drink was perfectly tart from the rhubarb and lime in the sorbet.